PUTRAJAYA, Malaysia, May 9, 2014 (ENS) – Malaysia’s first electric vehicle car sharing program will get underway in August in the Klang Valley, an area includes Malaysia’s capital city Kuala Lumpur and its suburbs and adjoining cities and towns in the state of Selangor. The CMS Consortium Sdn Bhd will roll out the EV car sharing initiative called a “Cohesive Mobility Solution (COMOS)” with about 30 to 40 electric vehicles to be placed in selected hot spots in the Klang Valley, according to Bernama, a news agency of the government of Malaysia. This includes EV charging providers, EV fleet operators, parking management operators and telecommunications network operators. Cars in the program will include the Renault Zoe and the smaller Renault Twizy, among others. On Tuesday, the COMOS EV car sharing was given a “soft launch” by the Minister of International Trade and Industry Datuk Seri Mustapa Mohamed in Putrajaya. Mustapa said the EV car sharing program was the first such initiative in Malaysia as well as in the ASEAN [Association of Southeast Asian Nations] region. He said it could help reduce carbon dioxide emissions and the consumption of fuel, leading to lower fuel subsidies. “Car sharing is form of public transportation hence it is able to reduce the traffic congestion,” the minister said. Speaking to the media after the soft launch event, COMOS Executive Chairman Datuk Seri Syed Zainal Abidin Syed Mohamad Tahir said with the initial capital outlay of RM5-7 million in Malaysian ringgits (US$1.53 million to 2.15 million) the group aims to have 3,500 electric cars available for sharing nationwide by 2020. After the Klang Valley roll out, said Syed Zainal, another 20 to 30 electric cars will be placed in Langkawi for sharing by November of this year. Langkawi is an archipelago of 104 islands in the Andaman Sea, some 30 km off the mainland coast of northwestern Malaysia. For its second phase, Syed Zainal said the COMOS car sharing program would move into three places: Melaka on the coast of southern Peninsular Malaysia, the city of Johor Baharu on the peninsula’s southern tip and the more northerly city of Penang. 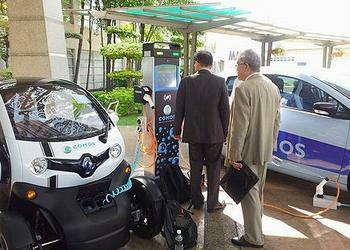 Finally the COMOS EVs would be available for sharing throughout Peninsular Malaysia. Questioned on the cost of driving a COMOS electric vehicle, Syed Zainal said that discussion is still ongoing but noted that the fee would slightly be higher than normal taxi charges. The consortium plans to offer both yearly and weekly COMOS memberships, he said. The COMOS program is scheduled to be launched officially by Prime Minister Datuk Seri Najib Tun Razak this August.